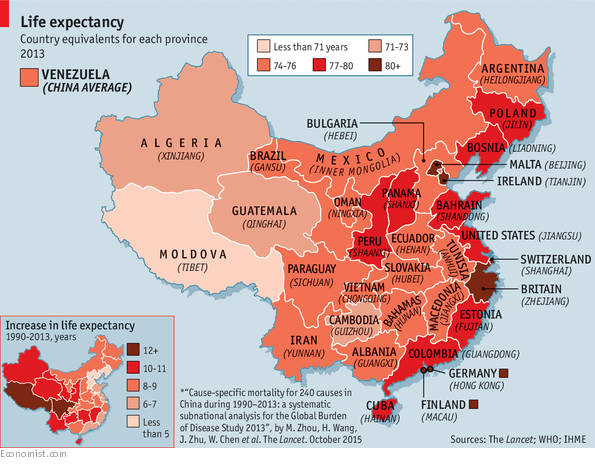 A View From The Cave: Map of the day: In which Chinese province will you live longest? Map of the day: In which Chinese province will you live longest? As is the case for nearly everywhere in the world, all parts of a country are not created equal. This map from The Economist shows the varying outcomes in each province. The study* shows that a baby born in China in 1990 would live on average to the age of 68. One born in 2013 could expect to reach 76, beyond the age at which Confucius said “one can follow one’s heart’s desires—without crossing the line.” There is a large disparity between provinces, but the gap is narrowing. In Shanghai life expectancy is now 83—as good as Switzerland. People in six areas live longer than Americans. The most impressive progress has taken place in the most benighted regions: a child in Tibet born in 1990 had a life expectancy of 56, akin to one of the poorest African countries. This has risen to 70, roughly the same as Moldova, one of Europe’s poorer countries.